Creating API Users And Keys. Learn how to add API users and keys to your business. API keys are used for authenticating API requests from applications and websites integrated with any of Hubtel's APIs. The keys consist of the apiId and the apiKey which together form an added layer of security and authenticity for all API requests. Before any integration can take place, the keys need to be generated through a very simple process. Keys are associated to an Employee and a Branch of your business. Kindly note that only Super Admins or Administrations can add an API User and manage API keys. In the menu bar, click the profile icon and then Settings -> Business Settings -> Employees. Once here, click the Add button on your top right. Select API User from the drop down list. Full Name (first name and last name) – This employee name will be associated with all sales made using the key generated. Mobile Phone Number – This employee mobile number will be associated with all sales made using the key generated. 5. Click Add after providing correct and accurate details to create the API User account. 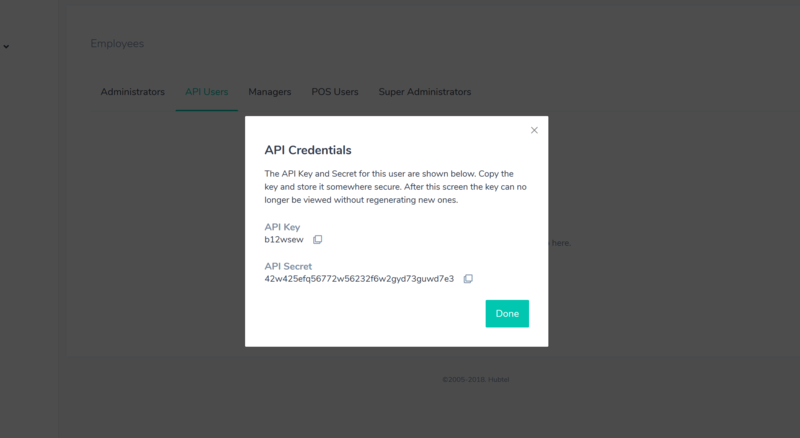 The next step is to copy the API key and API secret that is displayed immediately after an API User is successfully created. Voila! You can now create your awesome apps. 8. Click Done to complete the process. to regenerate the keys again.